Apart from a rough idea of the countries we want to visit, we have no firm plans for this round-the-world trip, so we end up planning things only a couple of days in advance. Sometimes that works against us (in Machu Picchu for instance, we couldn’t get tickets for Huyana), but in most cases it works great. A Panamax going through the canal’s locks: there’s less than half a meter of clearance on either side! Sure Jules, that looks exactly like Portugal’s flag! Thinking of buying a flat in Balboa Avenue? Hope you saved a lot, because it’s one of the most expensive avenues in the world! Going straight from Galapagos to strolling below tall skyscrapers is quite a leap! Unless you spend a lot of time in saunas, strolling around Panama City is not exactly pleasant, as the temperature hovers around 30 degrees (85 Fahrenheit) with close to 100% humidity. Fortunately you sort of get used to it, and by the time we hit the Panama Canal we looked a bit less miserable. 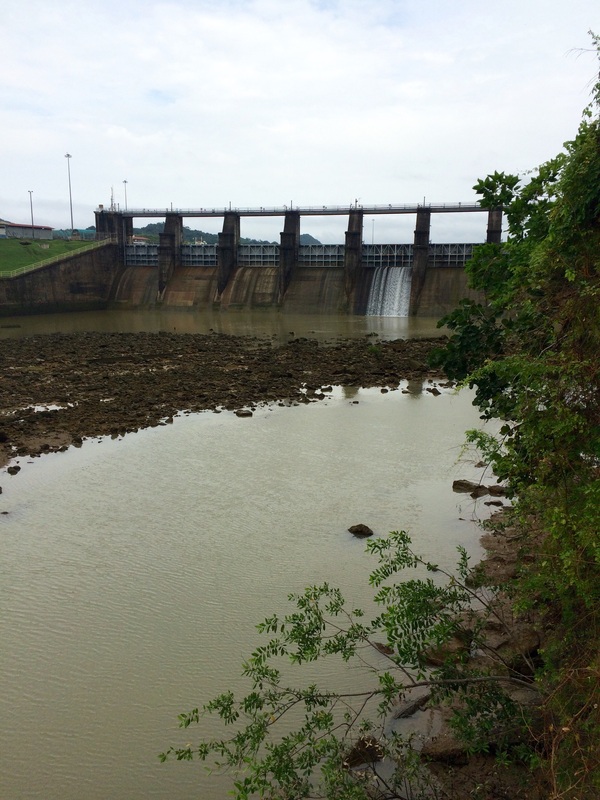 The Panama Canal is one impressive feat of engineering. It connects the Pacific and Atlantic oceans, saving precious time for ships traveling through the Americas (which would otherwise have to go around South America). The idea of connecting the two oceans is an old one but only in 1914, after several failed attempts, was it actually done. The canal changed the face of Panama forever, as it resulted in an incredibly diverse population (additional workers from the Caribbean joined the indigenous, Spanish and French descendants) and a close relationship with the United States (responsible for building and operating the canal till 1999, when its ownership reverted back to Panama). Today the Canal brings in more than $1 billion in earnings and attracts many thousands of visitors per year. 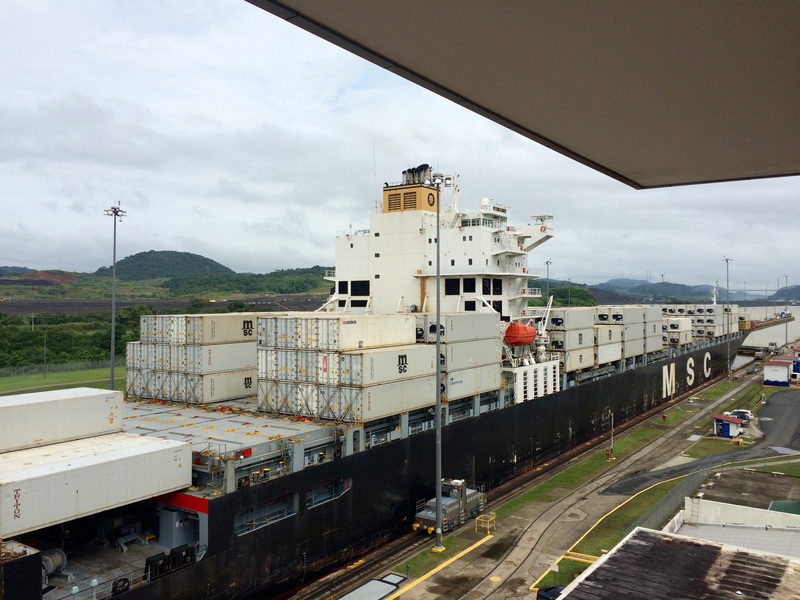 We timed our visit to be able to see a Panamax go through the Canal’s ingenious locks: these cargo ships get their name from the fact that they have the absolute maximum size that can squeeze through the canal. It’s a sight to see, there’s no more than half a meter between the ship and the canal’s walls! Oh, and there’s also crocodiles in there. Next up was ‘Casco Viejo’, the old historical district where Panama City was founded in 1673. The trip there illustrates how the city’s history is intertwined with that of the US and France: you first pass through the old US military town (before 1979, the US managed not only the Canal but also an area spanning 8 kilometers around it), then by ‘El Chorrilo’ (a pretty dodgy neighborhood that was mostly destroyed in the 1989 US invasion of Panama, when Manuel Noriega was deposed), and when you enter ‘Casco Viejo’ (a UNESCO World Heritage site) you’re transported to France. This neighborhood was where most Frenchmen involved in the late 19th century attempt to build the Panama Canal stayed, which explains the French inspired colonial and neoclassical architecture. In every corner of ‘Casco Viejo’ you’ll also find a little stand selling Panama hats. Ditch these: Panama hats are actually of Equatorian origin, and are much cheaper there! Next to ‘Casco Viejo’ sits ‘Avenida Balboa’, the newest and swankiest part of town. Who was this fellow Balboa, that not only gets an avenue but also lends his name to Panama’s currency? Vasco Núñez de Balboa was a Spanish explorer that become the first European to reach the Pacific Ocean, in 1512. Balboa, who found little more than huts when he arrived to Panama, would be dumbfounded by the avenue that bears his name: boasting some of the most expensive real estate in the world, it stands witness to the rapid growth of Panama City. Depois das Galápagos… o Panamá parece ficar bastante aquém… Também para nós, leitores atentos :), parece ser um grande salto! Até breve, dêem notícias da Costa Rica! What a great great blog! I’ll leave it open on my computer so that I can go through all your posts. And nice to meet you btw. All the best. Portugal – we love Portugal! And we’ll go back! Magical places, lovely people and so much history…Please say hi to your wonderful country for us!